In recent years stollen has become as much a feature of Christmas as figgy pudding. But nowhere do they celebrate the festive cake as seriously as in Dresden where each year there is a giant stollen parade through the city. 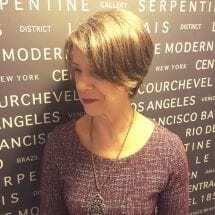 Words by Irene Caswell. Food plays just as important a part of Christmas today as the custom of gift-giving. While the UK has traditionally celebrated with figgy pudding, we Brits are not averse to adopting food from around the world and making them our own. The German stollen is now a familiar sweet treat at festive markets and on the supermarket shelves, from a mini ‘all-mine’ size to a family plenty-for-all version. Incredibly, around 4,000,000 Dresdner Christstollen© were sold in Germany in 2017. In Dresden, master bakers go so far as to produce a giant stollen – last year weighing around 2,980 kilograms – which is caried through the streets at the annual Stollenfest or Stollen Parade, along the Dresden Zwinger, past the Semper Opera House, the Hofkirche and the Frauenkirche (Church of our Lady) where Bach gave the very first Christmas organ concert in 1736. On safe arrival at the church it is cut into pieces and offered to the 60,000 or so visitors in aid of a good cause. Roughly 400 stollen trays, each weighing 8 kilograms, are assembled together to create the giant stollen. Once called “Striezel” the bread-like cake, gave its name to one of Germany’s oldest Christmas Market, Dresden’s Striezelmarkt founded in 1434. The Stollenfest marks the official opening of the market which runs throughout advent until Christmas Eve. Stollen was originally a food eaten during mediaeval fasting and Dresden Christstollen© is first recorded in 1474 on a bill at a Christian hospital called St. Bartholomew’s. In the middle Ages the Catholic Church precluded festive pleasures, including eating butter and milk, and the stollen was made using only flour, yeast and water. A reversal of the ban on butter by the Saxons, who have always enjoyed life’s little pleasures, meant the bakers could reform the stollen, using richer ingredients. A piece of interesting trivia, it was Prince Ernst, Elector of Saxony, and his brother Albrecht who appealed to Pope Innocent VIII to revoke the ban on butter. The Holy Father granted their wish with a Butterbrief, or butter missive, dispatched to Dresden in 1491. The Dresdner stolen carries a seal, awarded to only 125 bakeries and confectioners in the Dresden area, as a mark of authenticity. The giant stolen is made using around 500,000 raisins, 450 kilograms of butter, almost 800 kilograms of flour and 250 kilograms sugar. The Dresden Stollen’s reputation grew through royal approval from 1560 and the city’s bakers traditionally presented their sovereign with one or two festive stollen at Christmas. In 1730, a stollen for Augustus the Strong, probably Saxony’s most famous elector and on military campaign, called on 100 bakers and their journeymen to combine 3,600 eggs, 326 churns of milk and 20 hundredweight of flour to produce a giant stollen weighing around 1.8 tons. Untypically, this oversized stollen was baked with eggs, and in June. 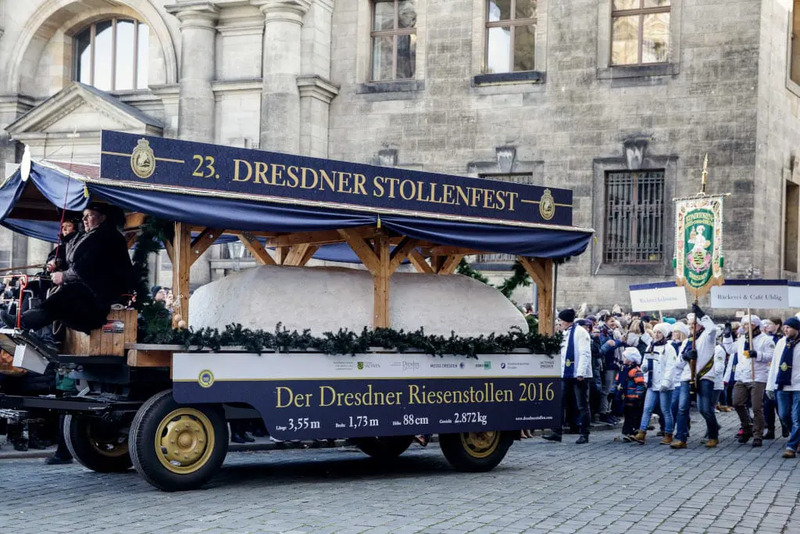 The concept of the Dresden Christenstollen© was born. Today it is transported on a horse drawn carriage through the city. This is the pre-Christmas highlight of the Saxon capital which began in 1994 and attracts visitors from all over the world. The procession begins at the Hotel Taschenbergpalais and continues past many beautiful sights of the Saxon capital while leading towards the Striezelmarkt. 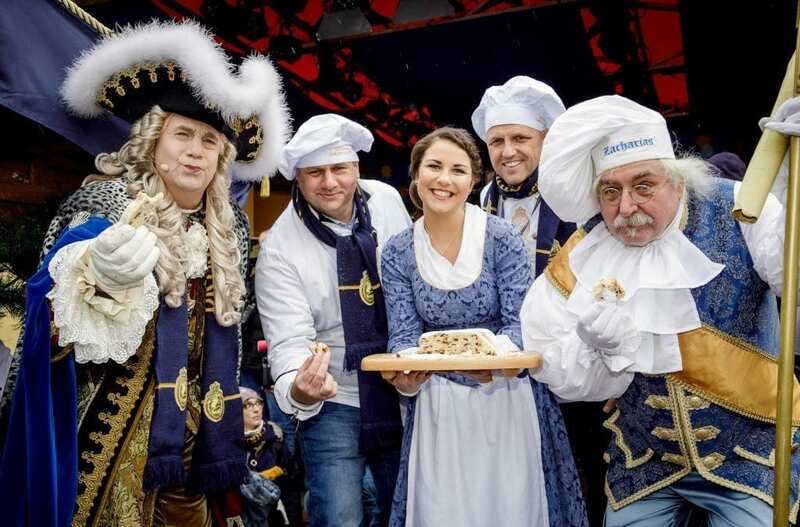 The Dresdner Stollenmädchen, the bakers and pastry makers of the Stollen Association, marching bands, actors in historical costumes, regiments of soldiers and other participants form a colourful parade, cheered on by thousands of spectators along the route. The Stollenfest is not simply a day of fun but also a serious endeavour to preserve the craft and tradition of the bakers and pastry makers of Saxony. Be sure to visit the Showroom Bakery at the Striezelmarkt to watch the famous pastry being made. The Dresdner Christstollen© recipe is very specific. The heavy yeast dough is made with milk and enriched with raisins, butter, sweet and bitter almonds, as well as candied orange and lemon peel. To feature the Dresden Christollen© seal bakers must use only the spices and spirits listed in the Stollen Association’s recipe ingredients. Any addition of margarine or artificial preservatives and flavours is not allowed. However, each stollen is unique as variations on the amount of raisins or spices is down to the master baker. Some bakers butter the stollen twice after baking to give an extra glaze and richness. Some stollen bakers offer hands-on tours and workshops behind the scenes where guests can make and bake their own stollen, with a little professional help, naturally. Can’t make it to Dresden, read our guide to 15 Christmas markets in Europe and the UK. The stollen season lasts 60 days and traditionally starts on 1 November and ends on 31 December. 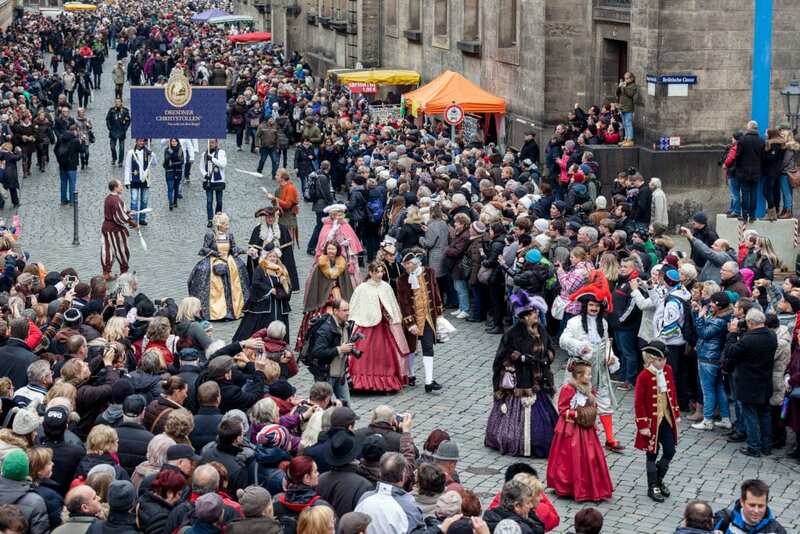 The Dresden Striezelmarkt runs from 28 November to the 24 December 2018 daily from 10 am until 9 pm. 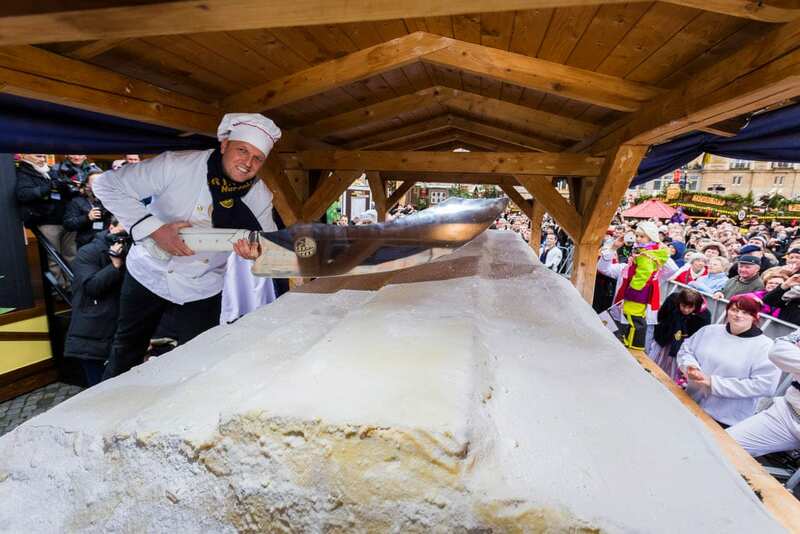 The parade of the giant Stollen will take place on 8 December. On the Advent weekends at the end of November and in December hotels prices are very high so it is a good idea to visit midweek. You can book tickets through our Hotel Booking Portal.